Part and parcel of being a Michigan DUI and driver’s license restoration lawyer is being, almost by definition a suspended and revoked license lawyer, as well. In Michigan, driving while license suspended (DWLS) violates the very same law as driving while license revoked (DWLR), but the two offenses are very different, particularly because the long range consequences of driving while license revoked are so much more severe. In this article, we will focus on the Michigan Secretary of State administrative sanctions for a conviction of driving while license revoked, differentiating them from those that are spelled out in the criminal law. To begin, I should point out that the consequences to be examined are the same no matter where in Michigan a person lives. 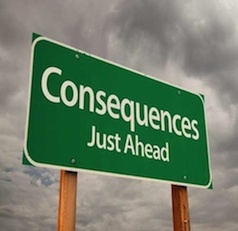 While the range of court-imposed (meaning criminal) consequences of a driving while license revoked case are spelled out in the law, and can differ based solely upon the location of the court or the temperament of the Judge, our focus is going to be upon the mandatory (and therefore non-negotiable) sanctions that the Michigan Secretary of State must hand out when someone with a revoked license is caught driving. If you’re license has been revoked, it almost always means you’ve had multiple DUI convictions. Anyone in this predicament knows that you never just “get” a revoked license back. Unlike a suspended license, where you will eventually become eligible for reinstatement after a certain period of time, or if you pay a certain amount of money, a person with a revoked license only ever becomes eligible to file a formal license appeal and have his or her case decided after a hearing in front of the Michigan Secretary of State’s DAAD, or Driver Assessment and Appeal Division. Only when you’ve been approved (and that means proving, by “clear and convincing evidence,” that your alcohol problem is both “under control” and “likely to remain under control“) do you ever win back the privilege to drive, and even then you’re placed on a restricted license and required to drive with an ignition interlock device for at least the first year. This pretty much means that having lost your license for multiple DUI’s automatically puts you at a disadvantage. Since my purpose here is to be informative, then I’d ask the reader to indulge me a bit and let me speak plainly, rather than try and tiptoe politely around the real issues. If your license has been revoked, the court sees you as dangerous. While no one has his or her license suspended for singing too loud in the church choir, you certainly don’t get your license revoked because all you did was forget to pay a ticket. When you’re license is revoked, it means that you’ve practically been on a mission to screw things up. That part of your life may be over, but not the consequences. When you go to court, it’s about a million times better to be part of the “everybody else” group. In the previous article entitled “The Problem with Michigan DUI Cases,” I tried to explain the trend that accounts for almost everyone facing a DUI being seen and treated as if they have a drinking problem. Here, in the context of revoked licenses, we’re dealing with folks that have multiple convictions for DUI. Dragged back into court for driving when they are clearly not supposed to, there is a natural tendency on the part of any Judge to see such a driver as out of control and determined to do what he or she wants, regardless of laws or rules or anything like that. By contrast, if you’re part of the “everyone else” category, that means you’re license has merely been suspended, and often for something like not paying a ticket or getting too many points. Whatever else, that kind of person is seen as negligent, more than any kind of threat on the road. Even though we’re trying to focus on the consequences ultimately imposed by the Secretary of State, the kind of deal, or plea, that you get in court on your DWLR case directly affects that. Accordingly, it becomes a very important part of my job to be keenly aware of the many nuances both of the plea, including how to get the best one, and the consequences that the Secretary of State will impose as a result thereof. This, frankly, is where my expertise as a Michigan driver’s license restoration lawyer makes a huge difference. Beyond knowing how to make things better in court, I know how to make things better down the road. And it’s about here that we come to the real heart of this issue. Most people, although certainly not everyone, knows that if you’re license is revoked, and you get caught driving and are charged with “driving while licensed revoked,” and you plead guilty to that charge, you’re license will be revoked all over again for what is called a “like” additional period, meaning that if it was originally revoked for 1 year, you get revoked for another year. If you’re license was revoked for 5 years, then you’ll get your license revoked for another 5 years. Here’s the part that even many lawyers don’t know; it doesn’t matter if you had you’re license revoked for 1 year, and that happened 5 years ago, meaning you’ve been “eligible” to file for a license restoration hearing for 5 years, if you plead guilty to ANY moving violation, the Secretary of State will impose another “like” (meaning the same length of time that you’re under, or that you never got restored from) revocation. One of the more common calls that comes into my office is from someone who hired a lawyer (not me!) in just this situation and was told that the plea deal that had been worked out didn’t carry a mandatory license penalty, only to wind up getting a notice from the Secretary of State informing them that they’ve been revoked all over again. These callers wonder if their lawyer lied them to, or if the Secretary of State has made a mistake. Of course, after the “stuff” hits the fan, they get serious about their homework and find this blog, or my site, and then call me, when it’s too late to do anything. I mean this sarcastically, of course, but you have no idea how much fun it is to explain to someone that the Secretary of State has not made a mistake, and that they lawyer did not, if fact lie to them, it’s just a matter of a nuance of the law that he or she didn’t know, and now they’re essentially screwed. There’s one other important point to quickly make here: Sometimes, for whatever reason, a person whose license is revoked will get written up for DWLS, or driving while license suspended. That couldn’t matter less. If you’re revoked, it’s that status, and not the charge, that matters. Even if you go right into court and plead guilty to “driving while license suspended,” it will go on your record and affect you the same way as if you had simply pled guilty to driving while license revoked. The point I’m making here is that if you have a revoked license and you somehow get a ticket for “DWLS,” you absolutely have not gotten any kind of break. For anyone reading this before you go to court on a revoked license charge, here’s the deal: No matter what plea deal you can get, and completely irrespective of the fact that such a deal specifically DOES NOT carry any license penalty whatsoever, when the Secretary of State receives notification that you have been convicted of any moving violation, it absolutely must and will revoke your license all over again for another “like” period of time. The big mistake a less experienced lawyer will make is to negotiate a plea deal that reduces a driving while license revoked charge to something like “no ops,” meaning “failure to display a valid license.” If you don’t know better, you will get sold this deal on the promise (correct, but only to a point) that there will be no points placed on your record, that there will be no automatic license sanctions, and no driver responsibility fee, all of which is true. But then the Secretary of State will thereafter send an you and order of action that revokes your license anyway. The confusion here is that while a certain traffic offense itself does not carry a license sanction, the Secretary of State’s rules require that anyone whose license is revoked and who is reported by a court as having been convicted of any moving violation (any kind of offense that means the person had to have been driving) must be given an additional “like” period of revocation. This is an administrative penalty, and not part of the law governing something like a “no ops” or failure to display a valid license. If you don’t know this, and you represent yourself, then you kind of got what you paid for in terms of legal representation. If you’re facing a revoked license charge, given the long-term consequences (another 1 or 5 years with a revoked license, meaning no chance to even start the license appeal process until the new revocation period has elapsed), it’s probably better to hire a license lawyer, like me, who can, to the extent possible, safely navigate you through the process. You won’t usually find this level of skill in the class of lawyers who think their best asset is being the cheapest. This brings up two important points. First, as a lawyer with this rather specialized skill set, I’m not interested about competing with the low bidder crowd. Second, no matter what you pay, there is no guarantee that you can avoid the administrative sanctions as well as those consequences that flow from whatever kind of plea deal can be worked out. In other words, it’s one thing to get a great deal for someone facing a revoked license charge whose record, beyond the underlying DUI’s, isn’t too bad, but it’s another thing when someone in that situation seems gets caught driving without a license somewhat regularly. In addition, and as always with anything related to a criminal offense, the city where your case is pending is very important. Every lawyer knows that Macomb and Wayne Counties are much “easier” places to work things out more favorably than Oakland. In fact, I’d wonder about any lawyer that wasn’t up front about that right out of the gate. The bottom line is that a driving while license revoked (DWLR) charge is very serious, and not because of any penalty the charge itself carries, but because of the almost hidden administrative penalties the Secretary of State will impose unless your case is skillfully handled and resolved in a way that avoids them. I can help with that, often in ways you’ll never know.